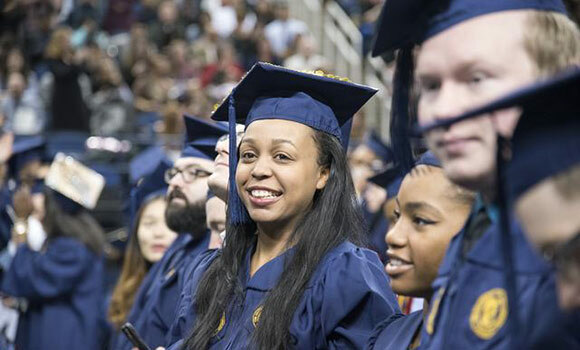 More than 2,600 students will become UNCG alumni at the university’s 2017 May Commencement on Friday, May 12, at 10 a.m. at the Greensboro Coliseum. UNCG will award approximately 2,623 earned degrees: 1,989 bachelor’s degrees, 540 master’s degrees, 12 specialist in education degrees and 82 doctoral degrees. Seventy of these degrees will be awarded to international students. Honorary degrees will be presented to Dr. Mansukh C. Wani and William “Bill” Mangum Jr. ’75, ’83 MFA. Wani, an internationally-recognized scientist and pioneer in the field of cancer research, will receive a Doctor of Science honorary degree. Mangum, an acclaimed visual artist, entrepreneur, author and philanthropist, will receive a Doctor of Humane Letters honorary degree. UNCG will also award its first doctor of nursing practice degree, as well as the first bachelor of science degree in psychology. Previously, UNCG offered only a bachelor of arts degree in psychology. Margot Lee Shetterly, best-selling author of the book “Hidden Figures,” will present the commencement address to the university’s 2017 graduating class. Maya Perry, a senior majoring in political science and sociology with a minor in Spanish, will serve as the student speaker. The ceremony is free and open to the public, and parking at the Greensboro Coliseum is free for students and their guests. As a service to the campus community, Park & Ride buses will transport volunteers, students, staff and faculty between campus and the coliseum. Buses will depart campus every 30 minutes beginning at 7 a.m., with the final shuttle returning to campus at 1 p.m. Passengers may board the bus on Stirling Street in front of Elliott University Center. Individuals who are unable to attend the ceremony may watch a live stream here. For more information about May Commencement, visit the Commencement Central website. Don’t forget to share this milestone with the campus community on social media! Tag your posts #uncggrad, especially during the week of commencement. Your family and friends might see them on display before the ceremony! Look for our Snapchat filters at the coliseum on the day of the ceremony. Participate in the Alumni Association’s #UNCGNewAlum contest, starting May 1. Get the details at alumni.uncg.edu/uncgnewalum.